Russia's veteran Soyuz spacecraft was equipped with Kazbek cosmonaut chairs, named after a mountain in the Caucasus range. Each Kazbek required a seat liner custom-made for its individual user. 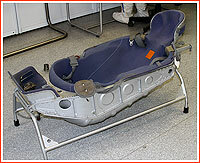 Every seat liner would be uniquely molded to the body size and other "anthropometrical" parameters of each individual cosmonaut, in order to provide maximum cushioning during landing. 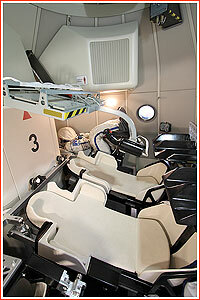 If cosmonauts in orbit wanted to "switch seats," seat liners had to be installed in respective positions first. The manufacturing of seat liners required a great deal of time and effort, adding to the cost and complexity of Soyuz missions. 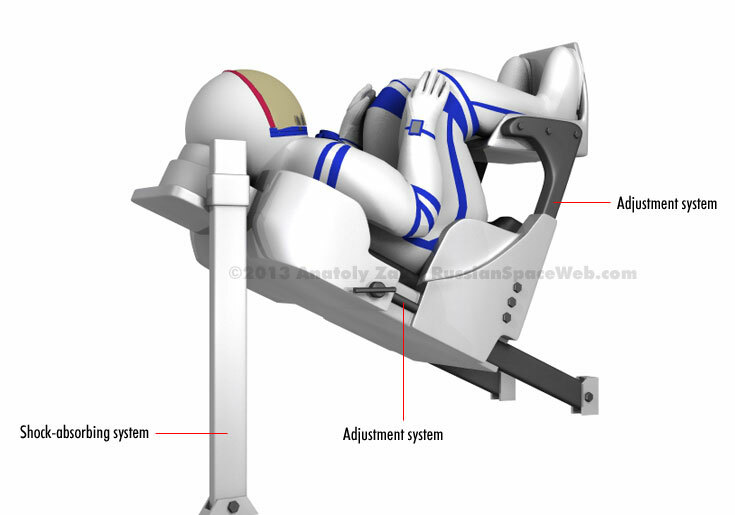 Not surprisingly, developers of Russia's next-generation spacecraft, PTK NP, hoped to do away with custom-built components, replacing them with a reusable seat that could be adjusted to any member of the cosmonaut corps, a foreign astronaut or a space tourist. 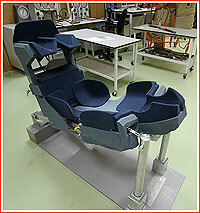 The new-generation cosmonaut chair was dubbed Cheget -- yet another great mountain in the Caucasus. Traditionally for all cosmonaut gear and life-support hardware, the development of the Cheget chair was delegated to NPP Zvezda, based in the town of Tomilino, southeast of Moscow. 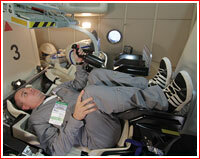 By 2012, the first scale models of the Cheget chair were manufactured and during 2013, the first full-scale mockup of the Cheget chair was assembled. Russian engineers used innovative 3D printing technology to produce scale models and components of the full-scale prototype. Four real-size prototypes of the Cheget chair were also manufactured and installed inside a full-scale model of the PTK NP spacecraft, which was displayed at the Moscow Air and Space Show in Zhukovsky in August 2013. For the operational version of the Cheget chair, Russian engineers planned to use new carbon material, which promised 60 kilograms in savings when compared to a metal version of the same chair. In September 2018, RKK Energia announced that NPP Zvezda had manufactured a prototype of the Cheget chair based on the company's technical assignment and that NPP Zvezda had initiated production of the chairs for full-scale tests. A series of tests aimed to assess ergonomic functionality of the chairs were planned with the participation of specialists from the company's design and flight test division, RKK Energia said.